Before baby arrives, we research the safest car seat, the best monitor and pick out the sweetest little bits of clothing you ever did see. I remember that when we chose our car seat/stroller combo, I joked saying that this little mode of transportation was half of what my first car cost me. Granted, it was a clunker. It was rusty and noisy but it had a sunroof and it was all mine for only $800! We dream big for our children. It’s the way it is supposed to be. We want the best for our wee ones and strive to offer them a safe place to snuggle and the chance to blossom into all that they are intended to become. As a new parent, it felt like there was a barrage of decisions to be made, many of which I remember feeling ill equipped to make. As we buckled in our first little bundle into his seat at the hospital, I was shocked that the nurses would let us leave without a phone book sized manual to get through the first week. Even though I had devoted 10 years of my life to children and their families in the early learning setting, I still felt overwhelmed by the responsibility of taking care of my sweet boy. Hours turned into days and then into weeks. My tiny newborn grew into an inquisitive baby. We spent hours snuggling, looking at books and invested in tummy time. 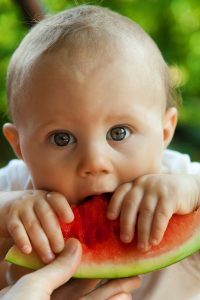 Before I knew it, I was researching starting solids. Back in those days, the norm was to start with cereal of some sort. I happily started making and freezing little bits of food in ice cube trays. Homemade food was the primary source of table food for my little guys. From time to time though, it was very convenient to have a few jars along for an outing. 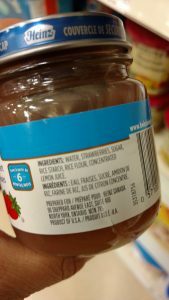 I remember being shocked in the baby food aisle at how many jars of food had added sugar. Back then, I wasn’t a nutritionist, but my gut told me that added sugar didn’t belong in baby food. Naturally occurring sugar in the form of fruits and veggies gets the thumbs up from me. Being a baby is tiresome work. Naturally occurring sugar is needed for physical and mental energy and development. Recently, I read an article about sugar still being added to baby food. I was shocked and needed to check it out for myself. We live in world where childhood obesity and type 2 diabetes are becoming increasingly common among our children. Children are ours to protect and teach. We can start by making sure that the food we feed our babies doesn’t contain any added sugar. 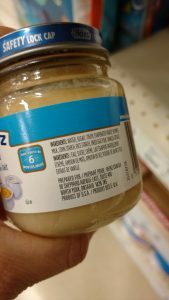 If you find baby food on your grocery store shelves, take a moment and send the company a polite but clear message that added sugar doesn’t belong in baby food. When mamas & papas join forces, we can move mountains and evoke change. Will you join me? Here we are twelve years and two boys later and we are still learning on the fly. Sometimes I feel like I am rocking this motherhood thing…and other times, not so much. The learning curve eases from time to time and there is rest. 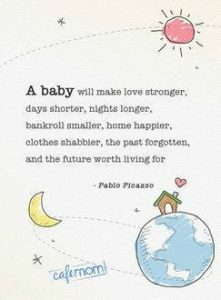 Other times, I feel like I am buckling up my baby boy for the first time again as we enter a new stage of development. Everyday feels like an adventure in me learning to let go and trust my boys. We are on the cusp of hormones, puberty, larger grocery bills and teenage hood. Oh mercy! I am up for the challenge but sometimes, I wonder where those ity bity boys went. Just when I can’t bear the speed of their fleeting childhood, they intuitively do something that melts away my reservations and replaces them with awe of the young men they are becoming. If you are new to this whole parenting journey, it can feel overwhelming to say the least. Don’t be shy about asking for and receiving help when it is offered. If you would like a little guidance as you feed your baby, I’m here to help. Now is the right time to establish healthy habits that will last a lifetime! Email me at amy@designedforyounutrition.com or call me at 519-503-7926.